Well, I haven't been posting for almost 5 days, although I think I haven't ever cooked so much like I did these days. Almost every day I stood in the kitchen from morning till evening and I kept on cooking, baking and doing the dishes. If not, then I spent my time reading cookbooks. 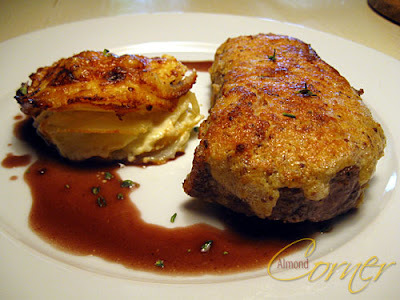 However, I am going to post a dish that I totally forgot about and I do not even remember when I made it: horseradish crusted entrecôte with potato gratin and Bordelaise sauce. By the way my freezer project is stuck. To be honest it is full again! For the crust peel and dice shallot and stew in butter, then let it cool. Mix egg yolk, horseradish, cream, mustard, breadcrumbs and shallot, season with salt and pepper. Let is stand for 10 minutes. Beat egg white and stir in to the horseradish paste. Leave it in the fridge until you need it. Melt butter oil, season the entrecôtes with salt and pepper and fry for 2 or 5 minutes from both sides (depending on the way you want them). 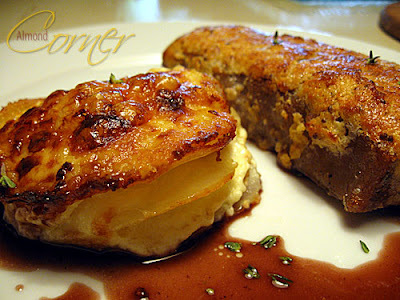 Heat the oven to the highest possible grilling temperature and grill the crusted entrecôtes until golden brown. gute Idee mit dem Eigelb in der Kruste, so wirds leichter gebräunt.